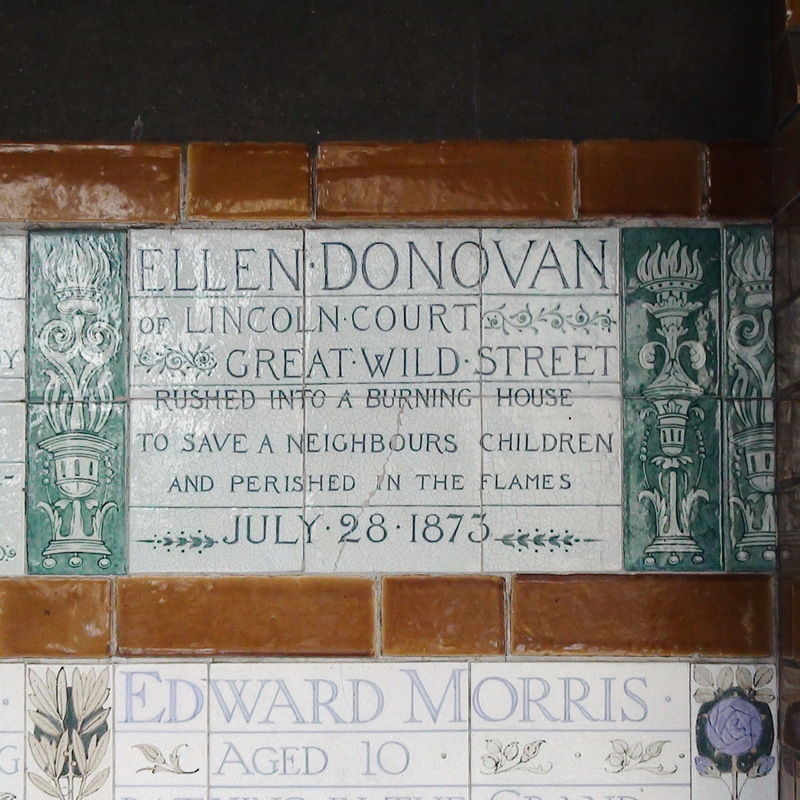 Ellen Donovan of Lincoln Court, Great Wild Street, rushed into a burning house to save a neigbour’s children and perished in the flames. July 28, 1873. This garden acquired its name due to its popularity as a lunchtime garden with workers from the nearby General Post Office (long gone). Watts had been thinking of a monument to the bravery of ordinary people since at least 1866, collecting newspaper clippings that told their stories. Most of this garden was formerly St Botolph's Aldersgate churchyard and the vicar and churchwardens offered this corner as the site so here it was built, designed by Ernest George. The frieze on the fascia board reads: "In commemoration of heroic self sacrifice - 1899". The loggia has space on the back wall for memorials, in 5 rows separated into 6 tiled bays each 4 memorials wide; that’s 5 rows of 24 spaces each; 120 potential memorials. To date (2017) it holds only 54, and those were erected, spasmodically, 1900 - 31 with just one added since - in 2009. In the story below we indicate the running total of memorials at the time as [count 0]. We have labelled the memorials according to their position. e.g. ‘4C - Emery’ is the memorial in the 4th row, 3rd column, for Edmund Emery. Attached to the dividing pier between bays 3 and 4 is a wooden carved relief showing a statue inside a classical architectural niche, with an inscription on the plinth. To the left of the loggia is a framed information board created in the same style as the individual memorials. We have given each of these a page of its own: PP - GFW and PP - Watts carving, respectively. This ‘Wall of Heroes’ was initially unveiled on 30 July 1900, with only 4 plaques in place, in the left-most bay (A-D) on the centre row, our row 3 [count 4]. Nine more memorials were added to that row on 4 May 1902. For some reason they were put in bays 2 and 5 (E-H and Q-T) and the last slot in bay 6 (X) [count 13]. The subject of all of the plaques to this point had been chosen by Watts from his newspaper clippings archive. In January 1904 a committee was formed to oversee this memorial project, including Watts and the vicar and churchwardens of St Botolph's. When Watts died in July 1904 his wife Mary, who had already been heavily involved, formally took over his role. She selected 11 to complete the row (so bays 3, 4 and 6; I-L, M-P and U-W) and also had the small relief created as a memorial to Watts himself. These were all installed and unveiled 13 December 1905 [count 24]. Up to this point all tiles had been made by William De Morgan, known to Watts, but he had ceased making tiles and so the commission for the next 24 memorials went to Royal Doulton, who changed the design (to our mind, greatly for the better). These 24 were installed in row 4 (A-X), on 21 August 1908 [count 48]. When Alfred Smith died heroically in Finsbury, close to this memorial, as a result of a 1917 WW1 bomb, funds were raised for a plaque here and 13 June 1919 it was placed at the start of row 2 (A), the row above the two already completed [count 49]. Mary did not like the Doulton style, and her energies were more involved in Compton, so by 1930 she had withdrawn from the committee. No one had thought to keep Watts’ list of potential heroes up to date and it was now thought to be too out of date to be a source for heroes. The Metropolitan Police provided 3 names and memorials were made. It was decided at the same time to correct an error in one of the early plaques: the Pumping Works plaque had been installed at 3G but Watts had given the date as 1885 instead of 1895. The incorrect memorial was removed and a new plaque was made in the Doulton style so, on 15 October 1930, four plaques were erected in row 2: the 3 new police memorials (2E, 2F and 2G) and 2H - Pumping Works, all in the second bay (thus leaving 3 empty spaces in the first bay, beside Smith) [count 52]. The unveiling ceremony also commemorated the 50th anniversary of the opening of the park. In April 1931, the empty slot, 3G, was plugged with the memorial for Maconoghu. To keep the style of the row consistent it needed to be in the De Morgan style. Mary helped find a ceramicist who had worked with De Morgan;Fred Passenger, who had set up his own business [count 53]. Following Mary Watts’ death in 1938 no more memorials were erected until 11 June 2009 when the Diocese of London arranged for Leigh Pitt’s plaque to be added, 2B - Pitt [count 54]. Everyday Heroism reports that in 2010 it was decided that it was best that no further plaques be added. We would like to know if at any point W. S. Gilbert was considered; he died of a heart attack while saving a young lady from drowning. Each memorial to heroic self sacrifice is individually hand-painted on to glazed ceramic tiles. These are decorated with foliage, flowers etc. seemingly scattered randomly but actually filling what would otherwise be white space due to the layout of the text, which is itself sometimes idiosyncratic. The rows of memorials are separated horizontally with plain brown tiles, which also clad the piers, but the tiles that separate them vertically are decorated with images of either rose stems, olive branches, or a pair of odd, rather baroque structures which may have an eternal flame at the top. Each row is in one of two styles. One style (by Doulton) uses a clean white background with the inscriptions etc. in a pale green and two shades of blue. The other style (by De Morgan) is, to our eyes, less attractive, the background is greyer, sometimes crazed, and the decorations are all in one dull green. A few of the tiles have particular decorations - fish, flames, etc. these are: 2A, 2B, 3C, 3D, 3W, 4C, 4H, 4I, 4M. All the tiles in row 2 and 4 are by Doulton (but see 2B - Pitt for a query). All the tiles in row 3 are by De Morgan with the exception of 3G which is by Passenger. 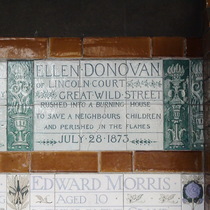 The tile with the rose stem at the bottom left of the whole arrangement also carries, in small lettering, “Doulton, Lambeth”. We note that in the top right of bay B (2H - Pumping Works) where one would expect a rose stem, the tile is actually plain white. Perhaps this is a deliberate design error, included as a reminder that only Allah is perfect. However, bearing in mind the history of the replacement of the Pumping Works plaque we think this explanation less likely. Perhaps it was a genuine error - they just forgot to make the necessary tiles. Prime organiser: G. F. Watts - 12; Mary Watts 36; Committee - 5; Diocese of London - 1. Maker: De Morgan - 23 ; Royal Doulton - 29 ; Passenger - 1; unknown (2007) - 1. Architect: Ernest George designed the loggia. For simplicity we have linked his page to only the first plaque installed, 3A. Call us lazy but we have decided not to research the people and stories told on the plaques. A number of other researchers have already done this both on-line and in books, etc. In particular see Everyday Heroism, Caroline’s Miscellany and London Details . These have done an excellent job and there is no point us re-treading the same ground. To bring something new to the party we decided to treat the plaques as a body of data and analyse that. 54 memorials describing 54 tragic events. For most events only one hero is named but there are 3 events with 2 heroes each; one with 3 and one with 4. A total of 62 heroes. The most frequent tragic event is drowning with 21 events: 10 in rivers (8 Thames, 2 Lea); 3 each in canals, ponds and the sea; 2 unspecified bodies of water. 2 of the ponds involved ice. The second most frequent event is fire with 16 events: 11 in the home; 3 in shop/pub/theatre; 1 industrial; 1 unspecified. Then 9 relate to transport: 5 trains; 2 horses; 2 road. Of the remaining events: 3 involved industrial gases; 2 war time bombs; 2 medical infections; and 1 quicksand. If you take London to reach as far as places like Twickenham, Thamesmead (which nowadays I think we do though maybe not early last century) then the vast majority, 48, of these events happened in London. We also did a necessarily rough breakdown by compass point: east 18; west 10; central 9; north 7; south 4. On at least one of the plaques the date given is the date of the hero's death, rather than the date of the event. Our analyses by date are broad enough to absorb this imprecision. By decade: the number of events that happened in the 1860s is 2; 1870s ~ 10; 1880s ~ 15; 1890s ~ 11; 1900s ~ 11; 1910s ~ 4; 2000s ~ 1. By month: As we transcribed the texts we thought some months were coming up more often than others so we analysed by month. Oddly November is the safest month with not a single of these tragic events happening in that month. July is the most dangerous, with 9. Other than that the range (2 - 7) seems about as random as one might expect. However, 32 took place in summer, and only 22 in winter (October - March), and that does seem significant; suggests that summer swimming being more lethal that open coal fires, apparently. Of our 62 heroes: 45 were men; 8 women; and 9 children aged 8-16, all male. 10 worked in industry; 9 in transport; 1 in entertainment; 5 were in white collar jobs (clerks, management); 6 PCs; 3 in the medical field; 2 fireman; 1 soldier; 1 clergyman. Occupation was unspecified for 15 of the adults. There is no indication that any of the heroes would have ticked any boxes other than “white" and "able-bodied” with the one exception of the man who was “suffering from severe spinal injury the result of a recent accident”. Most of the names seem English with fewer than 10 indicating some foreign heritage: Jewish, Irish, middle European, but nothing overtly Scottish. We are told much less about the (potential) victims, sometimes not even the number ( “many lives”, “her family”, “the train”) nor is it always clear whether or not they survived - we’ve assumed not where their survival is not explicitly stated. But where details are given: there are 24 children of which 6 are saved; 35 adults of which 21 are saved; of these adults 13 are identified as women of which 4 are saved. All we can say for certain is that 62 heroes gave their lives to save 27 people. If that were all it would not be a good return. However, take into account the “many lives” and all the people on “the train” etc., and the success rate is clearly much higher, though we cannot put a number on it. To our shame, while transcribing these plaques we found ourselves having to stifle a giggle. The retelling of so many different but equally incompetent rescues reads like the script for a slap-stick movie. We had to remind ourselves that there were real, brave, people, risking their lives to save others. These tweet-like plaques speak of times gone by: runaway horses, premises always at risk of catching fire, petroleum stored in cellars, and parents absent in India. We like the man who saved “the life of a stranger and a foreigner”, but our favourite is the one who tried “to save a lad from a dangerous entanglement of weed”. The texts are appealing but the graphics of the tiles, particularly Doulton’s, are delightful - they have a sure command of the lettering and the spacing while also bringing a lightness of touch, which is rare in plaques. If this loggia and its plaques feels familiar you may have seen the 2004 film Closer, in which it features. For more information about this hero click on the picture of her plaque.